One night I dreamed a dream. As I was walking along the beach with my Lord. Across the dark sky flashed scenes from my life. For each scene, I noticed two sets of footprints in the sand, One belonging to me and one to my Lord. 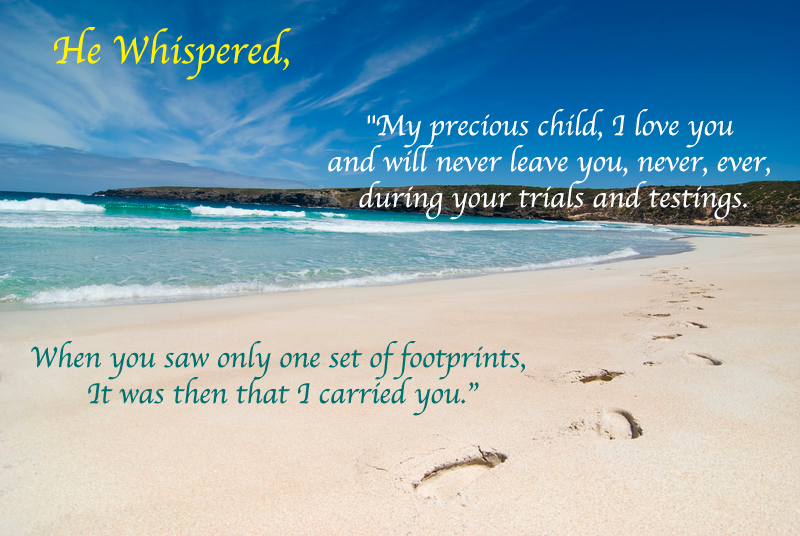 After the last scene of my life flashed before me, I looked back at the footprints in the sand. I noticed that at many times along the path of my life, especially at the very lowest and saddest times, there was only one set of footprints. This really troubled me, so I asked the Lord about it. “Lord, you said once I decided to follow you, You’d walk with me all the way. But I noticed that during the saddest and most troublesome times of my life, there was only one set of footprints. I don’t understand why, when I needed You the most, You would leave me.” He whispered, “My precious child, I love you and will never leave you Never, ever, during your trials and testings. When you saw only one set of footprints, It was then that I carried you.